Formerly the city walls enclosed the outside of the gate and it was not used for many years. This may be the reason why it has not been harmed, and it was only revealed when the walls collapsed. 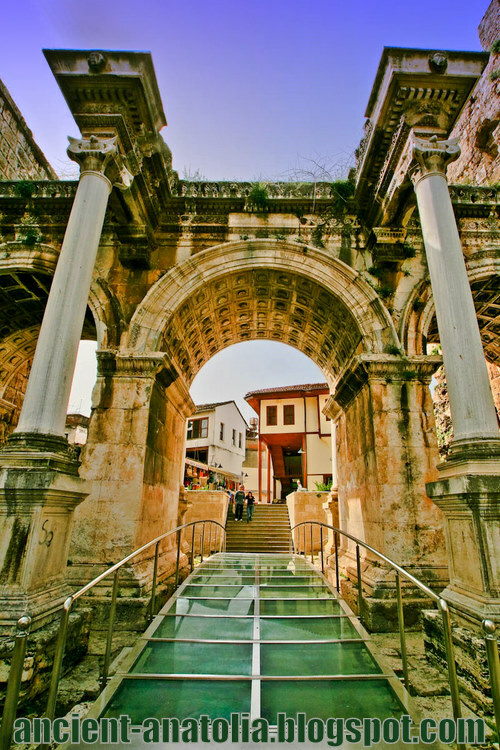 It is considered as Pamphylia's most beautiful Gate. The upper part has three apertures in the shape of a cupola, and except for the pillars is built entirely of white marble. The ornamentation is very striking. The original Gate was two storeys but little is known of the top storey. On either side of the Gate are towers, which are known not to have been built at the same time. The southern one is known as the Julia Sancta tower and is a work of the Hadrian era. It was constructed of plain stone blocks. While the base of the northern tower belongs to antiquity, the upper part is left over from the Seljuks.